After we all leave the church building on Christmas Eve – after the old friends who grew up here reconnect and go over to Broadway to find a place to have a drink together; after the choir trundles back downstairs to hang up their robes and put away their candles (you will put away your candles, won’t you?) and says ‘see you in the morning’; after the pastors hang up our robes and collect the sweet little gift bags that make their way to the office; after the deacons scour the pews and find some bulletins and a glasses case and hopefully no one’s cell phone – after we all leave this building on Christmas Eve, our faithful custodian will still be there. We will say good night to him, of course, and thank you, and see you in the morning and do you want us to stay with you till you’re done, but he will say no. No, I’m fine. And then I imagine he will double check the other building and turn off some stray lights. He’ll make sure the Christmas tree lights are unplugged, as well as the lights on the wreath in the balcony, and that the sound system is off. He’ll make sure the candles are really, truly extinguished. He may restock the paper goods in the restrooms. He probably won’t vacuum , and that’s fine. He’ll check the building to make sure everyone has left, and he’ll turn off the final lights, and set the alarm, and make his way home an hour after all the rest of us. I am grateful to the custodians, the ones who work at our church and all the custodians, who are the first to come and the last to go, the ones who turn the lights on and off, the ones who do the cleaning that most of us don’t want to do, the ones who fix dripping pipes and restock supplies, the ones who sweat or freeze down in the boiler room when the dang thing won’t work (again), who graciously receive all our complaints with the patience of Job. There is something holy in that work, don’t you think? There’s something in all those tasks that seem so mundane that echoes the divine a bit. Think about it. The first to show up and the last to leave. The one who cleans up the messes. The one who hears all the complaints with an expansive heart. The one who makes sure our spaces are safe and warm and welcoming with the most pragmatic of things. Sometimes I wonder if when Jesus comes back, he won’t seek out all the custodians and janitors and sextons first. They know. They know what it’s like to be a bit lonely in work whose scope is hard to appreciate by lay folk like you and me; they know what it’s like to clean up messes that we thoughtlessly left behind. They, like him, are the ones who are often unseen, unacknowledged, unappreciated. At Christmas we appreciate Jesus very much. We are so glad he was born, not simply because it gives us a chance to celebrate. We appreciate Jesus because he did something he didn’t have to do: he put on the mantle of human flesh, as that saying goes; he limited the divine unlimitedness to know us and save us, however we understand those verbs. We appreciate that little Lord asleep on the hay, that infant so tender and mild, the one whom shepherds greet with anthems sweet. We appreciate him less during other parts of the year, as the snow melts and carols are replaced by love songs or Irish jigs or “Here Comes Peter Cottontail” or whatever seasonal song needs to blast away in the elevator. We acknowledge Jesus less in July. He’s still at work, healing, cleaning up after us, receiving all the complaints. So maybe we can work on acknowledging him a bit more in July or September or Groundhog’s Day. In the meantime, think about those janitors and custodians: the ones at church and the school janitors, Lord love them; the folks who clean up airplanes, especially after a trans-continental flight; the ones in hospitals and nursing homes and stadiums. If you’re so moved, seek one out. Say thank you. It’s a holy thing to do for someone who does holy work. Mary is making the rounds again this Advent, and as per usual, I’m not entirely sure what to do with her. Is she the model of female submission? The victim of unwanted impregnation? Is she too young to marry and bear a child, or just the right age for her time and place? Is she quiet and shy, head bent down, eyes gazing at the floor? Or is she a warrior, a Rosie-the-Riveter, the woman who not only said yes but also said let’s topple the patriarchy? Is she the one who turned surprising news into a power play? Is she the faithful servant? Is she a good-enough mother? True confession: in the first few weeks after I gave birth, I found myself praying to Mary. I was pretty sure that God the Father and God the Son and that merry, floating, fire-y Holy Spirit could not begin to understand hemorrhoids, c-section scars, engorged breasts, and the complete feeling of inadequacy and terror, even with all the Godhead had learned during the Incarnation. So I sent a few up to the BVM. Because she knew. She had been there, and on a donkey, no less, in some small, non-private smelly place with animals, away from family, donut cushions, and Tylenol. 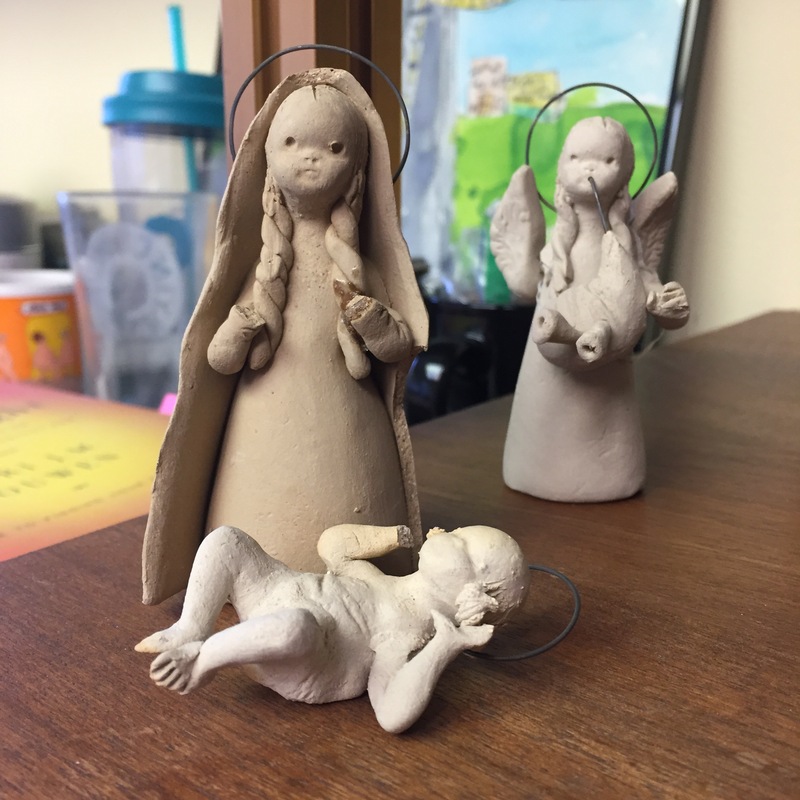 This week in worship our choir is presenting five songs about Mary and while I’m off the hook for a sermon, I do find myself wondering about Mary again. The Magnificat could be posted on Pantsuit Nation and get 10,000 likes. The role of women in Christianity could be looked at anew – are we simply to say yes to the church, yes that’s our role in the kitchen and the nursery, yes we’ll let the men do all the heavy lifting of teaching and preaching? Or do we look to Mary and say, hey, we’re called to topple thrones and send the rich away hungry? We’ll be in the kitchen and the pulpit, thank you very much. Mary fades from the story as it goes on; it is Jesus’ story, after all. Maybe the tune of the Magnificat faded too, and people forgot the melody. Maybe we lost sight of what a revolutionary Mary was. Maybe we need to reclaim that, for the church, for Pantsuit Nation, for our daughters, for our sons. For our world.